A "Self-Adaptive System" is quite simply one that has the internal ability to dynamically alter its analytical equations in real time to more closely adapt the system to ever changing market conditions. The systems accomplish this task by the diligent application of parallel functions. What makes Parallel User Function driven systems unique? Recall the old college days, just after that chemistry exam when you realized you should have spent more time reviewing the section on oxidation and reduction and less time on electron shell configuration? Or after the English exam when you found the test emphasis on sentence construction rather than proper pronoun usage, which you had spent all night studying? How about that last trade, when just waiting a few more minutes for your entry or exit would have turned the result into a profitable experience rather than another one of those annoying losses? Obviously, it’s not possible to turn the clock back and alter previous decisions. However, we have all, hopefully, over the years, learned from our previous experiences and have become better traders as the result of this learning process. Parallel Function Technology operates in much the same fashion as our own learning process. While there is no computer in existence, or even on the horizon, which can come close to the analytical capability of the human mind, we can, with our Parallel Function Technology, enable our trading systems to learn from their past experiences and become more effective as a result. The ultimate objective of all trading is to buy the low and sell the high. As you know this is much easier said that done. In fact it is, in all likelihood, altogether impossible. It is possible however to buy and sell in areas where price action determines that the trade has a higher probability of being profitable rather than losing. In this attempt, our Parallel Function based systems are always trying to identify optimum buy and sell areas. If the identification of this buy and sell area can be improved upon, the system recognizes this fact and will “self-adapt” to take this new understanding into account the next time a similar market situation arises. For example, let’s consider a trade placed by the Universal System. A set of specific mathematical equation is used to calculate all trading signals. Obviously, all the signals from this system are not perfect. In many instances, moving the entry point forward or back a few bars would improve the quality of the signal issued by this trading tool. Using historical data, we can easily determine the top or the bottom of the price move where the placement of our buy or sell signal would have been optimally placed. The system component of our Parallel Function programming examines the relationship of all the orders placed over a given period of time and compares the placement of the signals to what would have been the perfect placement of each order. The computer program then makes alterations to the base system equation in an attempt to more accurately place the proper buy and sell signals as they are issued by the system when similar chart patterns present themselves in the future. One might ask, at this point, with the self-adaptive nature of this system discussed above, why all the signals aren’t always perfect after the examination of an adequate amount of past data. The best answer to this question requires a more detailed examination of the forces that are responsible for the creation a price chart. Price charts are ultimately the expression of random human behavior in the market place. Much of this random activity is largely the result of analytical inputs, such as supply and demand, earnings and other hard numbers which are objective in nature and can be analyzed mathematically. The balance of the origin of market behavior is the result of human emotion, intuition and other non-analytical data and therefore much less repetitive and much more difficult to analyze from an objective approach. It is relatively simple to analyze, from a mathematical perspective, activity which arises from the repetitive activity generated by hard data. It is quite difficult, if not impossible, to objectively analyze and therefore predict the subjective result of emotion and intuition. Ultimately, therefore, it is mathematically possible to only predict a portion of the activity which goes into the creation of a price chart. In a sense, you are always shooting at a moving target from a mathematical standpoint, thus markedly decreasing the accuracy of perfect market prediction. However, with all of the above qualifications, the Parallel Function Technology which drives all of the Systems offered on this site has been shown by our research to be much more responsive to the ever changing conditions of today’s active markets than the standard indicator packages which use fixed mathematical processes to calculate their respective buy and sell signals. It is a common observation of experienced traders that markets are a constantly evolving, ever changing dynamic. A myriad of fundamental factors as well as random human behavior cause markets to constantly change their basic characteristics. After all, a price chart is nothing more than the graphical description of the multiple factors that effect prices. The creation of automated trading systems is often compromised by these changing market conditions. The challenge then becomes one of designing systems that are, in one fashion or another, able to change their characteristics automatically in response to frequent market changes. Presented here is a relatively new concept in automated system design that enables a system to dynamically alter its internal equations to more accurately keep page with the ever changing landscape of today's active, volatile markets. This presentation is designed to detail an additional tool which can be used to make trading systems more self adaptive and therefore more responsive to current market conditions. If a system uses back data in any manner it can be regarded as being self adaptive to one degree or another. Moving averages, standard deviations, breakouts, neural networks, etc. all rely on some historical price movement to generate buy and sell signals. This programming technique takes the self adaptive concept one step farther by using the system itself to adjust its own trading parameters for each trade. I wish to emphasize at the beginning that this is a programming technique which must be applied in a different manner to each and every system on which it is used. It is not a canned function or add on program which can be applied to any system. Also, since the programming involved in the application of this technique can be quite involved and extensive, it should be emphasized that this is not a fix - all for mediocre or poor systems. In fact, it will probably worsen the results of a poor system since the variables will constantly be reset to extreme values, making the equity swings of the system even more pronounced. Systems which respond best to this technique are those which are considered robust in nature and remain profitable over a progressive set of input variables. Such a system should show a bell curve pattern when the results of an optimization over the critical inputs is performed. Systems which respond well to frequent optimization will find this technique useful in improving performance and smoothing out equity curves. Traders and system developers regularly check variations of their system against recent back data in an attempt to discover if an underlying change in the market has effected the performance of their system. Done properly, this effort can be rewarded with improved system performance real - time. Improperly done, which is more often the case, frequent re - optimization leads to a system which is overly curve fitted and more prone to losses. The difficulty is knowing how often to optimize, over what system parameters and how much data should be used for each test. To come up with the correct testing parameters is a time consuming operation since there are so many variables to consider. Also, if the testing is to be accurate, a fairly large volume of past data should be considered. Through the use of parallel functions, one can set up a group of indicators which will graphically depict to the user when a significant change has occurred in the manner in which the system is responding to changes in market personality. Additionally, if warranted by indicator observation, the system can be altered to automatically change variable values when indicated by changes in the market. In this manner one is able to observe what the results of the system would have been had re-optimization occurred at regular, defined intervals over specified input values. When I began designing systems for currency trading in TradeStation several years ago I was quick to notice that the optimal variables which controlled the system equations would vary greatly from one contract month to another. My initial methodology involved an early range breakout system for trading the currency markets whereby the system would place breakout buy or sell stops slightly outside the early market range. Since the definition of the early range was critical to system performance, variables were used in the system to set the range by time of day, width of the early range, and the proximity of the current price to extreme range when the early range was defined. It was soon obvious that the best settings for the variables used to define the critical early range varied significantly from contract to contract. Even averaging the variables over several contracts produced only mediocre results. Obviously there was a characteristic somewhere in the activity of the market that was fluctuating regularly which resulted in the radical activity of the system. Also obviously, if the system was to be profitable in the future, I was critical to get a handle on the root of these fluctuations. One could always optimize the variables for each contract and make the system look like the best thing around but we all know by now that curve fitting is a quick way to overconfidence and a losing system. For months I analyzed every market parameter I could define - gaps, average daily range, daily open to close, ratios of high to low to open to close, tendency of a quiet day to follow a wild day, changes of market activity around big report days, and so on. Although measuring these parameters and using them to adjust the system variables was of some benefit to system performance, I was still unable to achieve the consistency across all data that I desired. Then one day it dawned on me - the best way to evaluate the market with respect to a particular system is the system itself! By running the system against a defined subset of past market data using a defined set of variables one could constantly monitor the performance of the system across all variable settings. Properly programmed, the system could constantly adjust critical variables to reflect optimum performance against recent market data. This technique operates in much the same fashion in which the pure market technician assesses the market. The pure technician ignores all fundamentals, confident that eventually all forces impacting on the market will be reflected in price. In much the same way, a parallel user function ignores all the myriad of technical forces in the market as they impact the system and concentrates only on the net effect of these changes in market characteristic on the system itself. Rather than trying to determine which phase of market activity is impacting the results of the system, we use the system itself to monitor changes in the market personality and make system adjustments accordingly. To accomplish this formidable task I created what I have chosen to call the Parallel User Function Approach to System Design. What is a "Parallel Function"? In the TradeStation platform, it is possible to program multiple subroutines, referred to as user functions, which process data "outside" the main system program, making the data generated in the function available to any program which calls the function. 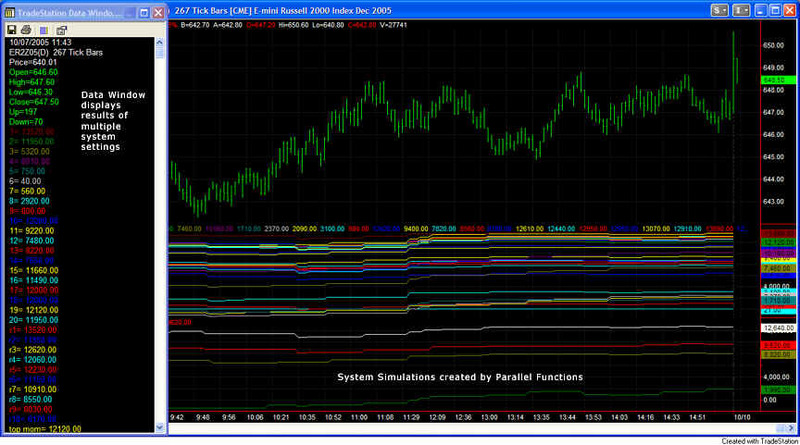 A "Parallel Function" is simply a TradeStation user function programmed as a system. Although the actual programming is significantly more complicated than that used to create an actual strategy, these functions allow the base system to actually self test itself against current market conditions and then utilize the prime system settings. In this fashion the base trading strategy is able to change its critical parameters and equations "on the fly" and therefore be much more responsive to the regular changes in market personality that plague most non adaptive systems. Self adaptive trading systems gain their advantage by continually testing themselves against nearby market data using parallel function technology. The parallel function is effectively running multiple systems in the background. By passing multiple levels of system inputs to the parallel function the base strategy is able to monitor the current behavior of the system against a wide array of input patterns. A simple sort routine then enables the base system to utilize the most effective input combinations for current trading. In this fashion, no matter what outside forces are causing regular changes in market personality, a self adaptive trading strategy utilizing parallel function technology is able to effectively alter its signal generation process to create a trading atmosphere more in line with the current market. The first step is obviously creating the parallel function. Care must be taken to assure that the function creates exactly the same returns as the base system - otherwise the function is useless as a trading aid. Programming these functions is more than a little complicated since many of the reserved words, such as buy, sell, buy to cover, sell short, etc. may not be used when programming a function. Next, within the parallel function or in another linked function, you must set up a routine to test all the system input combinations passed to the function from the base program. If you intend to use for - next loops to test and sort these inputs care must be taken to create the parallel function as a simple function as opposed to a series function which refers to a previous value of itself somewhere in the routine. Series functions are not able to be used in loops in easy language. Then, usually in the parallel function, it is necessary to set up a sort routine to isolate the best performing set of system variables from the group passed to the function from the base system. Finally, one must create a routine within the base system to retrieve the sorted system variables from the parallel function and properly replace these critical values for the next series of trades. Critical to the profitable performance of a self adaptive system are the parameters which govern the periodic retesting of the system which immediately resets the system variables. The timing of these retests and the range over which the system is allowed to test itself will be critical to the eventual profitability of the resulting strategy. In the example coded provided on this site, you will notice a "reset" input on the strategy for each parameter. In this example, I have allowed the system to reset each of the three system inputs independently. It is obviously also possible to reset all variables simultaneously. The frequency of retesting and the range of inputs over which to run the test is strictly dependent on the nature of the underlying system. While the example system seems to respond to very frequent retesting of all parameters ( 2 - 5 days currently ) other longer term systems will probably respond more effectively to a longer retest interval. I would suggest that a manual walk forward system optimization exercise would be the most efficient manner to determine the effective retest frequency and input ranges for any system to which this routine is to be applied. A parallel function may also be utilized as an indicator to plot the result of multiple system settings. Those not wishing to take this technology to the fully automated level may, in this manner, visually observe multiple settings of the system and use this information to manually make appropriate changes to the system being used for trading. In the chart above note the multiple plots below the price graph which display the real time equity curve of 30 separate system settings. The data window to the left of the chart reveals the current profitability of each graphed system setting. Although this use of parallel functions visually displays multiple system settings, the user must realize that these plots are the result of fixed input settings and do not offer the analysis of the range of system inputs that can be dynamically created by the automated parallel function system. Parallel functions are not a cure all for all systems. One must be certain that an effective trading strategy lies behind the logic of the main system. A robust system is a must before this technology should be applied. In fact, this theory will probably only make an ineffective system worse. Additionally, this is not a technology that can be applied as a "canned" function to any system. It must be specifically designed for each system to which it will be applied. While parallel function technology is difficult to apply and will not be suited to all system designs, the advantages of using the system itself to direct appropriate changes in critical system parameters are readily apparent when the technology is properly designed and applied. More information is available from the slide presentation used to present this topic at the TradeStationWorld conference in Las Vegas, Nevada, September 30 - October 2, 2005.